DEL CITY—Shane Hall, the beloved pastor of Del City, First Southern, died on Feb. 16 after a protracted and courageous battle with stomach cancer. The ministry and legacy Hall leaves behind has a nationwide, as well as eternal, impact. Hall, who was 46, is survived by his wife Misty and daughters Maci and Mallory. He lived nearly three years longer than doctors first predicted when they diagnosed his illness in October 2014. 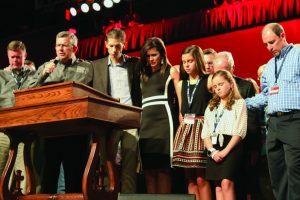 Throughout his health crisis, Oklahoma Baptists and people across the nation expressed prayer and support for the family since Hall’s illness was made public. A memorial service for Hall was held on Feb. 21 at Oklahoma City, Southern Hills. Numerous Oklahoma Baptist leaders spoke to the large gathering, as well as Hall’s longtime friend Noble McIntyre, who shared humurous stories from their childhood days and college years. Others who spoke or played a role on the program included Jordan, Doug Melton, Joe Sherrer, Steve Russell and Frank Page. The Singing Churchmen of Oklahoma sang various musical numbers. First Southern Baptist Church pastor Shane Hall (right) is joined by children’s minister Neal Livingston in baptizing Hall’s 10-year-old daughter Mallory. Mallory professed her faith in Christ Feb. 7 to her mother Misty, who led her in accepting Jesus as Lord and Savior. 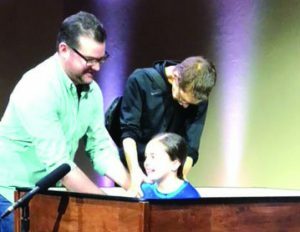 Misty had pushed Shane in a wheelchair into the sanctuary near the end of the worship service to allow him to assist First Southern’s children’s minister Neal Livingston in baptizing Mallory. He was able to help baptize his younger daughter, 10-year-old Mallory, Feb. 11. According to the Hall obituary, he began pastoring the same year he graduated from high school, 1989, having been called to Canute, First. Over the next 29 years, he also pastored Hobart, Washington Street; Bogalusa, La., Mount Pleasant; Tulsa, Calvary; Clinton, First; Lawton, First and finally Del City, First Southern where he served faithfully until his passing. Even after his diagnosis, Hall stayed faithful in remaining in the pulpit at Del City, in spite of challenges. Hall was invited to offer an opening prayer at a meeting of the United States House of Representatives in the summer of 2015. In 2016, he delivered the OBU commencement address at the spring graduation. Hall also preached at CrossTimbers Children’s Mission Adventure Camp in summer 2017, in spite of battling illness. He was able to share his testimony on Oklahoma City’s KWTV Channel 9 and numerous other media outlets throughout his battle with cancer. The obituary highlighted the Hall family’s legacy. “The son of Loyd and Bethel (Hale) Hall, Shane was born May 25, 1971, in Brook, Ind. His family moved from Fowler, Ind. to Burns Flat in 1982. Shane graduated from Burns Flat High School in 1989. He earned his bachelor’s degree from Oklahoma Baptist University and Master of Divinity from New Orleans Seminary. Shane and Misty were married on May 19, 2001, in Chickasha and made their first home in Tulsa. They became the parents of Maci Marie in 2004 and Mallory Mae in 2007. 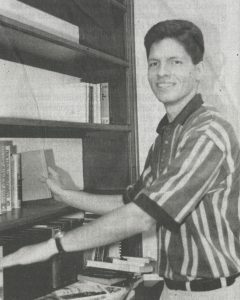 24-year-old Hall organizes his office after taking on his first full-time pastoral position in 1995. The Hall Family requested that, in lieu of flowers, memorial gifts be made to the BGCO to establish the Shane Hall Fund to support the Oklahoma Pastors’ Conference at the BGCO Annual Meeting. To give, visit bgco.org/hall-memorial. Though his life, which all prayed would last longer here on earth, Hall pointed people to Jesus. Hall’s life is one marked by an unmistakable legacy of faith.